Looking to upgrade or install a brand new ventilation fan in your bathroom? Schillings has the best selection of Panasonic Bath Fans on the market. All of these products are ready for your project today. Just stop in, pick your model, and leave with it that day. Panasonic is the premier manufacturer of powerful, energy-efficient ventilation fans that quietly exhaust unhealthy, unpleasant or moist air from your home or business. Contractors, builders, architects, and homeowners rely on us for our quality and for the wide array of solutions we offer—from bathroom fans with both motion and humidity sensors to remote in-line fans. Panasonic is proud to be recognized by the EPA for the fifth consecutive year, earning their most prestigious ENERGY STAR® honor, the Sustained Excellence 2014 Award. Sustained excellence is precisely what we strive for as evidenced by our legacy of providing high performance, energy efficient ventilation solutions. In fact, for over two decades—highlighted by industry-leading quiet fans, revolutionary DC Motor technology, and leading-edge LED lighting—we’ve continued to demonstrate outstanding leadership, year after year. Panasonic has been in the ventilation business for over 100 years and is the largest manufacturer of ventilation equipment globally. Panasonic produces the highest quality, most efficient and environmentally friendly products available in the market today. We do this by designing, engineering and manufacturing in our own facilities. 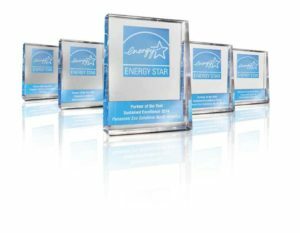 Panasonic is known around the world for offering the quietest ENERGY STAR® fans in the industry! Schillings currently has five models available from Panasonic’s Whisper series of bathroom fans. You will find a product available in every price range including the Whisper Welcome, Whisper Recessed LED, Whisper Green Select, Whisper Lite, and the Whisper Warm ventilation fan. For more information on each of our products, view our “In Stock Fans Hot List” below.